Combine ricotta, basil and salt and pepper in a bowl. Sandwich tomato slices together with ricotta mixture. Place tomatoes, stem side up, in a small baking dish just large enough to hold them. Place bread and garlic in a food processor. Process to crumbs. 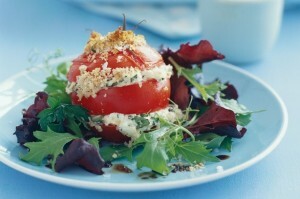 Sprinkle garlic crumbs over tomatoes. Roast, uncovered, for 20 minutes or until crumbs are golden and tomatoes are just tender. Divide salad leaves between serving plates. Place a tomato on each plate. Drizzle with vinegar. Season with salt and pepper.